If you like creamy soups, you will enjoy this Broccoli Cheese Soup, which may also be served in a Bread Bowl, rather than the traditional soup bowl. Cream soups are usually higher in calories, due to the creams and cheeses, but by preparing it yourself, you can lighten it up with low-fat cheese, and low-fat milk. 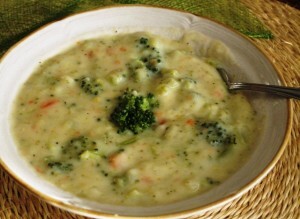 If you are not a big fan of broccoli as a side dish, you might surprise yourself, and really like this broccoli soup. Simmer potatoes, carrots, and celery in 4 cups of soup stock, for 20 minutes. Add broccoli and cook for 7 more minutes. Remove 1 cup of cooked broccoli, set aside. Saute chopped onion in 1 Tbs of canola oil, until golden. Add butter and minced garlic. Saute 1 minute longer. Pour the soup into a blender, or food processor to puree it. Return back to soup pot. Add sautéed onions and garlic. Mix corn starch, or flour, with 1/4 cup of milk, until smooth. Add to the remaining milk, and pour into the soup. Mix in shredded cheese, until melted. Fold in the reserved cooked broccoli. You may also cool it, refrigerate, and reheat before serving. You can create quick bread bowls, by scooping out crusty rolls, such as Portuguese Rolls, and serve the soup in them. You can prepare a quick soup stock by dissolving chicken, or vegetable bullion in water, per package directions. You can also use ready-made stock, if you do not have time to make your own homemade stock. For richer soup, and higher calories of course, you can use whole milk, or even cream and milk mixture.